One of the most pressing challenges faced by the Indian education system is to bridge the gap between the infrastructure and quality of education in a private school and that of a government school. While the government rethinks its model for public schools across the country, non-governmental organisations (NGOs) and citizen groups have taken it upon themselves to bring about change. The Avasar Foundation, a Bengaluru-based NGO recently inaugurated a pre-primary school at the Seegehalli Government Higher Primary School located in Kadugodi, near Whitefield in Bengaluru. This pre-primary school has been built on the kindergarten model that is seen in private schools today. The free-of-cost school will cater to the needs of children aged between 3 and 6 years from underprivileged families. Pre-primary education costs of one child in India can exceed a minimum of Rs. 45,000 per year in a private school. Combine the lack of government incentives and infrastructure with the acute financial barrier that families below the poverty line face, and you get a public education system which has to combat a serious setback. The Avasar Foundation plans to explore possible solutions. The problem isn’t only financial. Underprivileged families have not yet witnessed or know about the importance of pre-primary education. While government schools are still struggling to set the facility up, admission to private pre-primary schools only continues to become more competitive. Where many children embark on their journey of learning at the age of three in private schools, the kids who miss out on this have to spend time trying to catch up with other kids who had the opportunity. There are government preschools like Anganwadi’s. The Government of Karnataka has launched pre-primary (LKG and UKG) classes in government schools. But as of now, the gap still remains apparent. This is where the Avasar Foundation is trying to help. 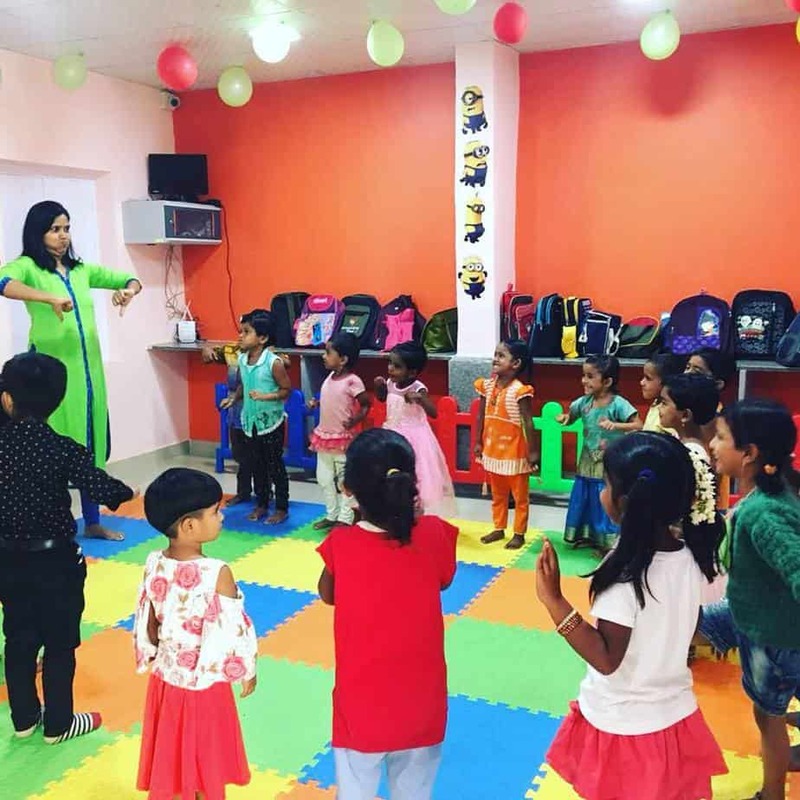 “The Avasar Pre-primary School bridges an important gap we notice in early childhood education, especially for the underprivileged families who cannot afford to send their wards to expensive private play schools. This is a pilot project and more such playschools will come up in neighbouring government schools from the next academic year based on the corporate sponsorship we are able to mobilise,” says Anand Chaturvedi, Managing Trustee, and Founder of The Avasar Foundation. The first school by the Avasar Foundation was unveiled on 6th July 2018 at the Government Higher Primary School, Seegehalli the parents and children in the presence of the BEO for K.R. 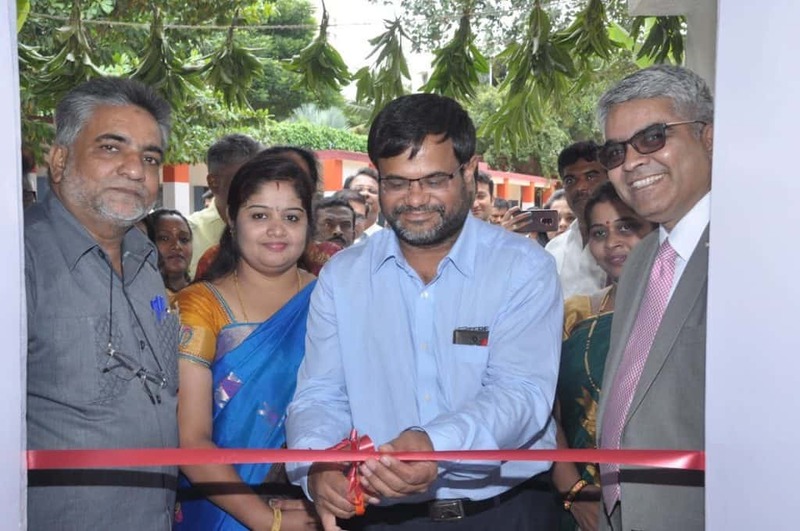 Puram, Saleem Pasha, and chief guest Kamlesh Jha, Director, Terex India. The event marked the official hand-over of the school to the government authorities. The preschool is part of the CSR project led by Expeditors- a Fortune 500, global logistics company. 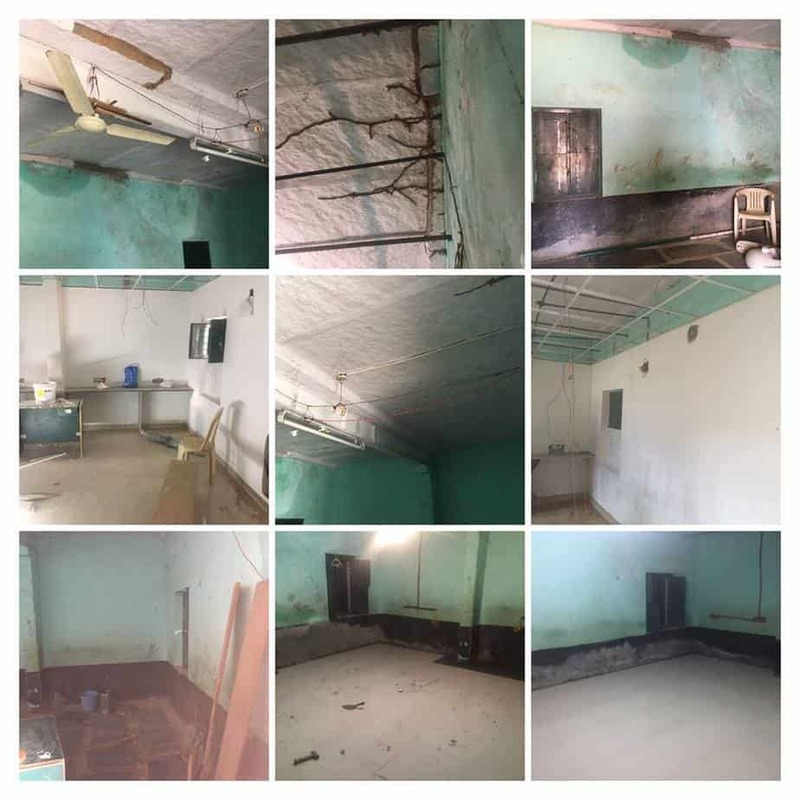 Avasar Foundation has not only invested in the infrastructure but has also provided the staff to maintain the school. The pre-primary school curriculum is structured along the lines of the private kindergarten model. The school has been completely redone. The rooms which now constitute the school were once dark, with paint chipping off walls and had a seepage issue. In their earlier condition, the rooms would not qualify to be a preschool on any account. Now the rooms are well-lit, colourful and exactly how one would envision a preschool to be. “Avasar Foundation has changed the look of the school, if you look at it now you wouldn’t think this is a government school!” said Saleem Pasha (BEO) about the new pre-primary school. Building a preschool requires those who engage in the project to consider many factors before drawing up plans. Preschools cater to the needs of children who are very young, therefore safety and security are of the utmost importance. Children need supervision and sensitive caretakers, therefore the selection of staff has to be done keeping this in mind. Refurbished at a cost of about Rs. 8 Lakhs, the state-of-the-art preschool will be managed by The Avasar Foundation – the implementation agency for Expeditors. The school is equipped to handle 40 students currently. Two teachers and a caretaker have been appointed to manage the school. Admissions and education at the preschool will be completely free of cost and will be allotted purely on a first-come-first-served basis. In addition to providing infrastructure to schools, it also provides faculty to ensure that the infrastructure is put to good use. The preschool has begun functioning in the academic year 2018-19 and the age group of the students enrolled is between three to six years. 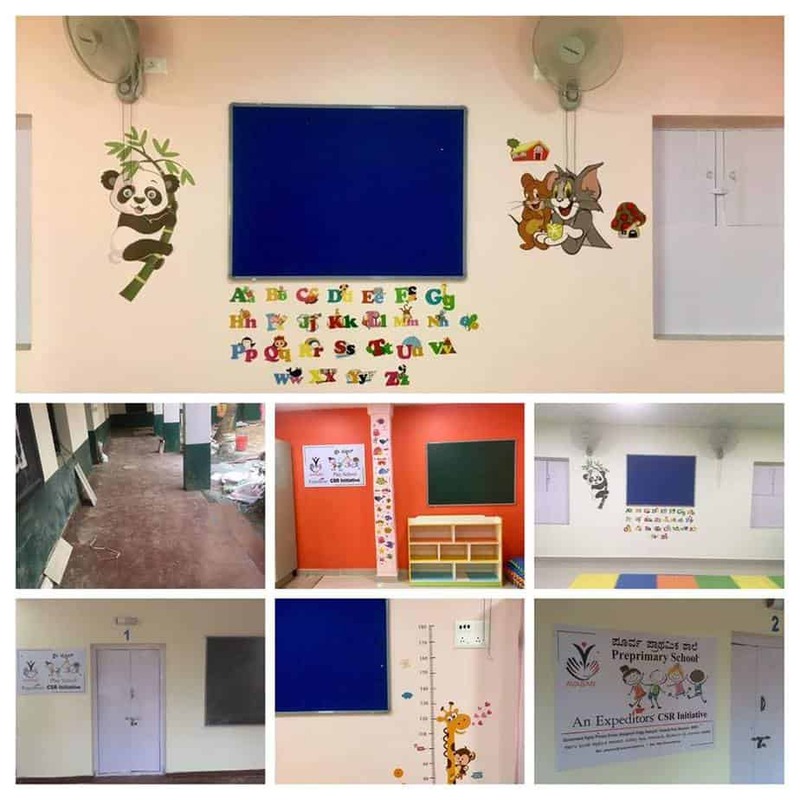 The preschool has incorporated all safety measures and young children’s needs, including CCTV surveillance, and disabled-friendly restrooms. There are two refurbished classrooms, one for the Lower Kindergarten students and the other for the Upper Kindergarten students. The preschool education of each child enrolled will be completed upon turning six. Through continuous evaluation and activities, the child will be assessed on his/her knowledge and ability to apply the same. The medium of instruction at the school will be the child’s mother tongue. A budget of Rs. 12-15 Lakhs for 2018-19 has been secured and the project is managed by Malavika Chaturvedi, Program Manager at The Avasar Foundation. 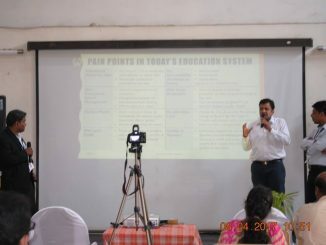 “It’s heart-warming to see organisations and individuals working for the betterment of government schools. Towns have temples, temples only flourish when all the people of the town join hands to ensure the upkeep of the temple. Otherwise, the temple will fall into disrepair. It’s the same with the (government) schools. I hope they continue to care about our schools like this,” said BEO, Saleem Pasha, at the inaugural function. The Avasar Foundation is a small NGO that has worked over the past six years on the gaps in the Indian government education system. Founded by Anand Chaturvedi and Sriram SN in 2012 as a CSR initiative of Expeditors, the organisation believes that, “Ability is nothing without opportunity.” The organisation is currently based in five major cities across India, and believes in bringing opportunities to those who have abilities but face financial and cultural barriers. Avasar’s scholarship program currently funds the education of 45 girls over the age of 15. The scholarship is provided on the basis of merit and need. It covers the entire cost of education right from PUC until they complete their undergraduate degrees. The NGO also provides skill training to the girls to ensure that they are not only educated but are also employed. Avasar Foundation’s Digital Literacy Program has provided state-of-the-art computer labs to government schools across India along with teachers to teach the subject in schools. Government education faces many hurdles on a day-to-day basis such as a lack of funding and inadequate infrastructure. It’s not enough to have classrooms and buildings, there need to be students in those classrooms and teachers to teach them. The Avasar pre-primary school then comes at a crucial time and doubles up as an optimistic sign of things to come. The real test for the school will be the response and the feedback it gets, and the ability to emulate the model elsewhere. Disclosure: The author has previously interned with the organisation.